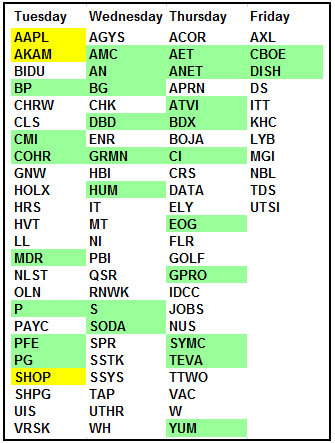 The narrowing market breadth we saw over the last several weeks has finally come back to bite us in the back. The FANG stocks led the charge higher and once cracks began to form in their armour the wheels came off their rally. First Netflix disappointed and has fallen 83 points in the last two weeks or -20%. Facebook missed on earnings and gave back 46 points or -23.5% over the last 4-weeks. Intel is down 10% over just the last two days. The superstocks, have met their kryptonite. 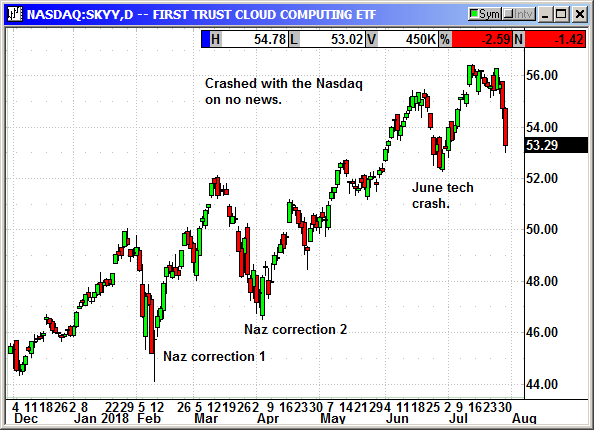 The Nasdaq has fallen 328 points or -4.6%in just three days. This decline should be coming to a close. The Tuesday before a Fed announcement is typically bullish. Sometimes the gains are minor but they are still gains. This could be enough to reverse the current trend. 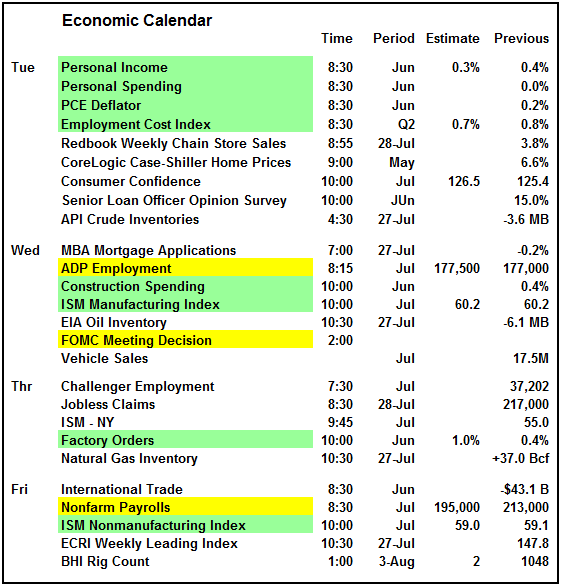 There are plenty of economics on the schedule this week with the ADP employment and the Nonfarm payrolls along with both ISM reports. The Fed announcement will be the biggest hurdle but analysts are cautiously optimistic. 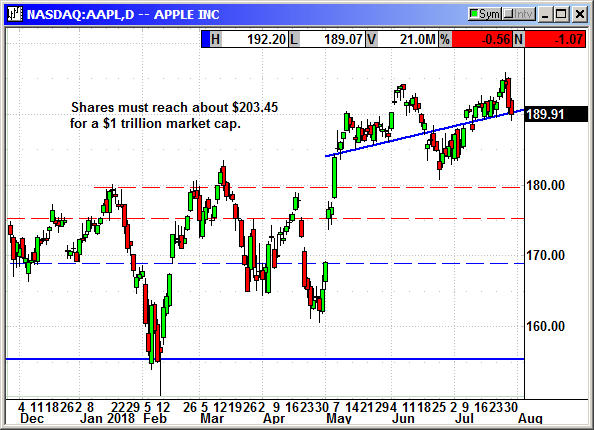 The big stock news on Tuesday will be the Apple earnings after the bell. Apple shares have been declining from their new high of $194.82 four days ago. Investors are afraid they will tank like Netflix or Facebook. It all depends on the guidance. Akamai and Shopify will be the next most closely watched reports. By the end of the week more than 400 of the S&P-500 companies will have reported and the lure of 22% earnings growth will begin to fade. 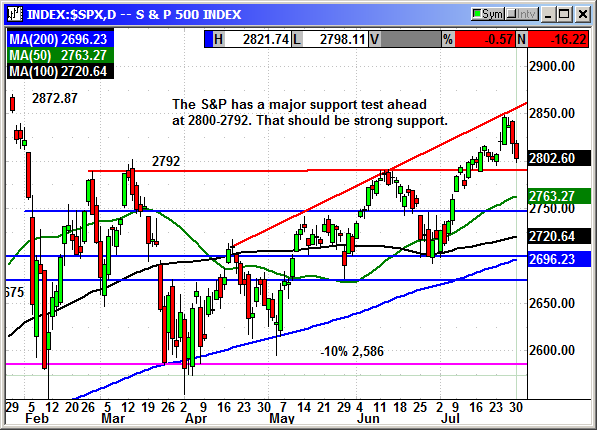 The S&P has suffered a couple of significant declines but still has strong support at 2792/2800. 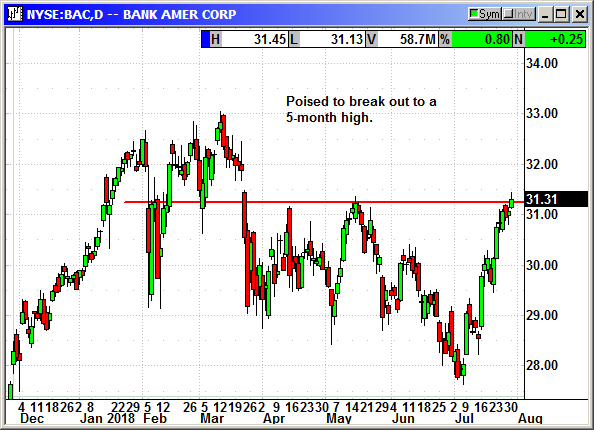 Those are the key levels to watch and they should hold if this is a garden-variety bout of profit taking. 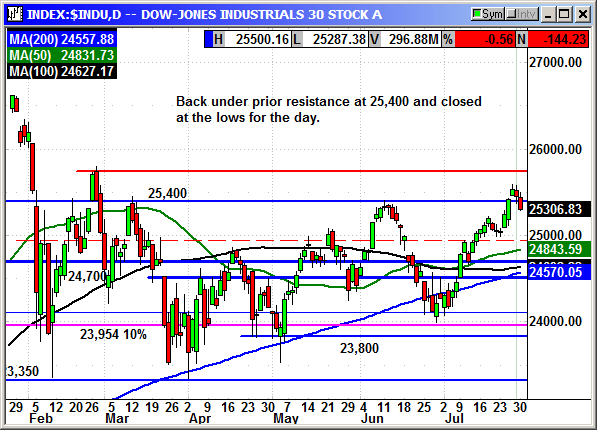 The Dow was still an index laggard and has fallen back below 25,400 once again. Support for the Dow is 25,000. The Dow has been stuck in a very wide range since the initial February rebound. There is a slight bullish bias but it is not exciting. 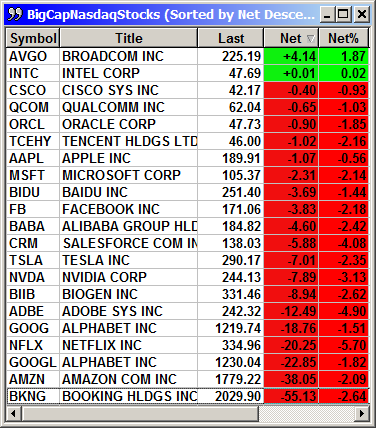 The Nasdaq did not have a chance on Monday. The big caps were down hard and the Nasdaq lost -107 points. 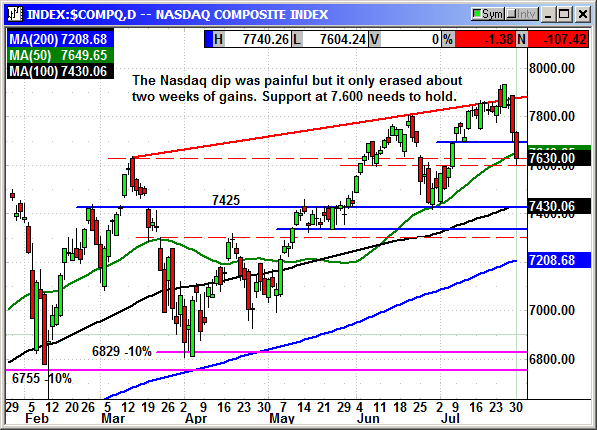 Initial support is 7.600 and that was almost tested today with a dip to 7,604. This is not strong support with that farther below at 7,425. This is what drove the market lower because the few big cap tech leaders were selling off hard. The Russell 2000 is no longer immune to tariff headlines. The plunging Nasdaq has poisoned the small cap index. 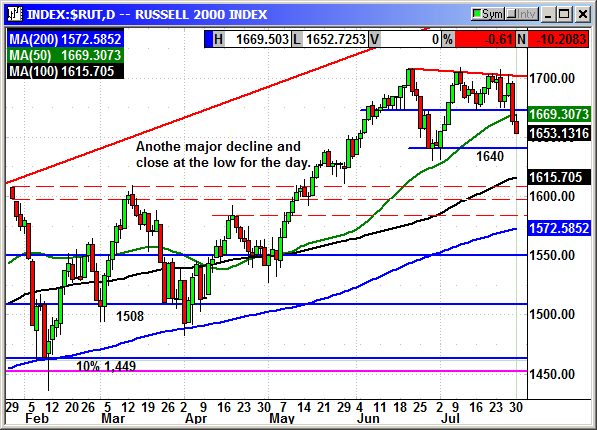 The techs, chips and biotechs are major components of the Russell. I expect a Tuesday rebound and depending on the strength and on the outcome of the Fed decision, the market could roll over again on Thursday or we could take another run at resistance. I would be very surprised to see a break out to new highs and would consider that attempt to be an amazing put opportunity. I wrote last week that I wanted to buy some index puts last week but thought maybe I was too early and put it off until this week. Now the big move could already be over and the opportunity was lost. Buy October $32 call, currently 90 cents. No initial stop loss. The long position was stopped at $167.55. The long position was stopped at $39.65. 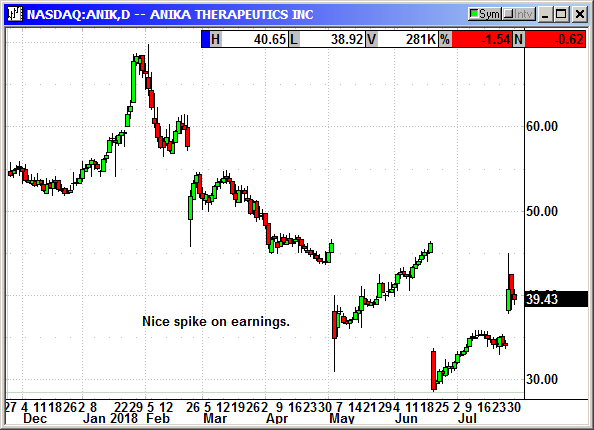 ANIK reported earnings of 68 cents on revenue of $30.5 million. Analysts were expecting $33 cents on revenue of $27.9 million. Shares spiked on the news and I am recommending we close the position. I clearly did not have the stop loss tight enough. 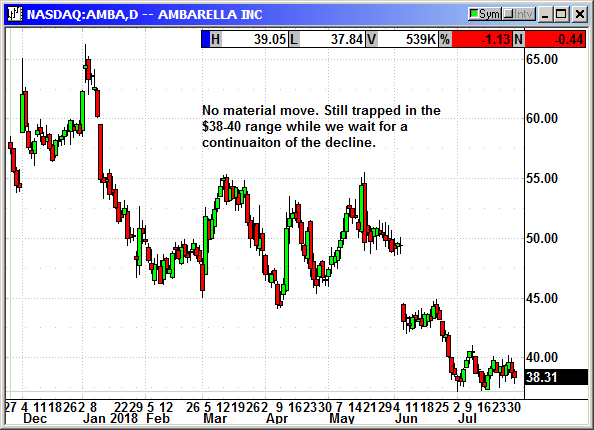 Shares tumbled from $29.50 to $25.50 over the last two days and did not trigger our stop loss at $25.25. 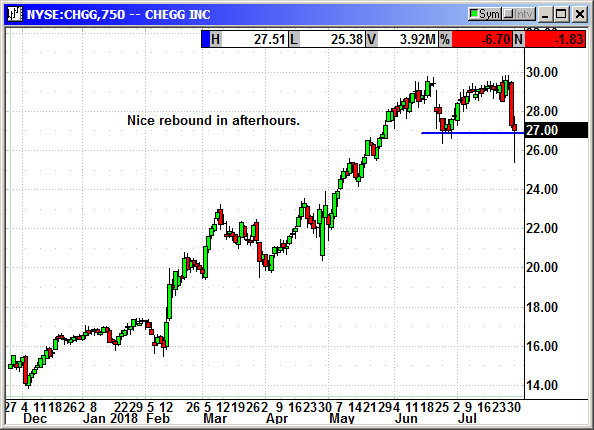 Fortunately, they reported earnings after the close and shares rallied back to $27.50 in afterhours. They reported earnings of 12 cents that beat estimates for 8 cents. Revenue of $74.2 million rose 32% and beat estimates for $70.2 million. We may get lucky and have the post earnings rebound continue. I would not bet on it. However, rather than speculate tonight on an exit I would rather wait and see what happens the rest of this week. We exited at the right time on this position. 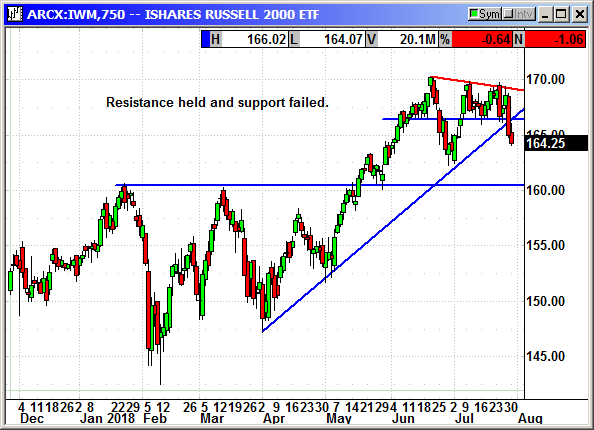 The Russell has completely broken down and the tech sector is imploding. That weighs on the Russell as well as the weakness in the biotechs and chips. 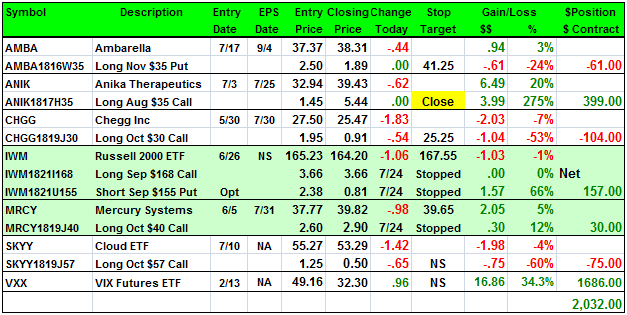 Closed 7/24: Long Sept $168 call @ $3.66, exit $3.66, breakeven. No specific news. 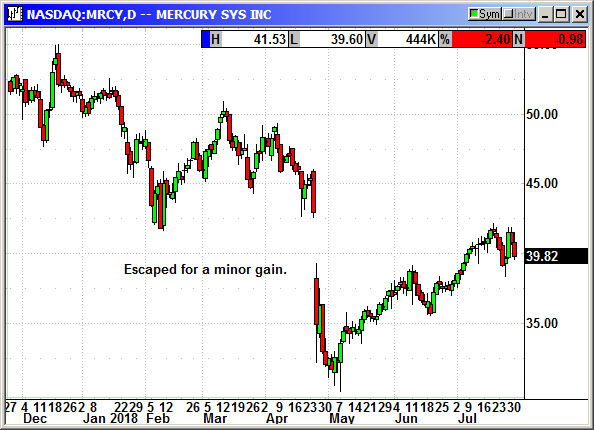 I tightened the stop loss last week and we exited for a minor gain. No specific news. Nearly a new high on Wednesday then crashed with the Nasdaq the last two days. 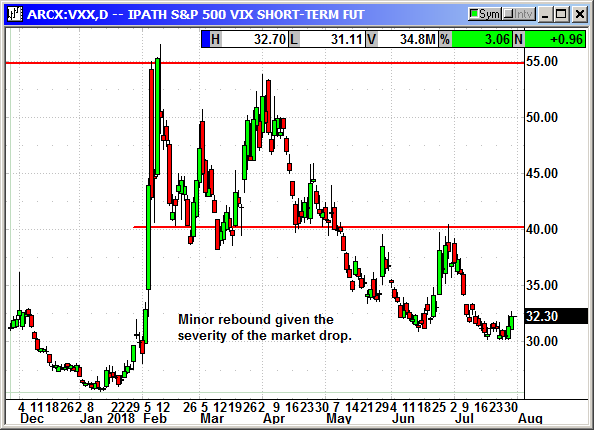 The VXX posted a minor rebound from the five-month lows as the tech sector craters the market.